Visit the Federation's website, click on Member Benefits for the complete updated list of membership benefits. You will have to set up a user id and password the first time you access this part of the site. 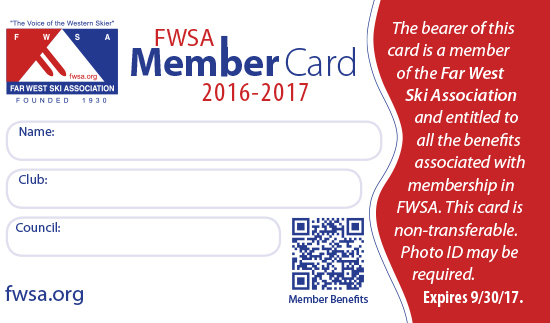 ALL Pacific Rim Alliance are also members of National Ski Council Federation (NSCF) and have access to many discounts including the following. Discounts up to 50% off are available. Hertz Car Rentals (see NSCF website for further details). Up to 20% off in the U.S. & Canada and up to 25% off Europe at www.hertz.com. Sport Innovations, Washington Depot, CT, (860) 488-5973. 50% off Heat Vario Plus shoe dryers and heaters from Mematec Products at www.sport-innovations.com/skiclub. SportStar Pro Sales (ProSunglass), 258 South Taylor Ave, Louisville, CO, (800) 784-4090. Up to 35% off Bolle goggles and up to 36% off Bolle helmets plus other manufacturers' products at pro form prices at www.ProSunglass.com (see NSCF website for further details). Ski Daddle Rolling Ski Tote, Arlington, TX, (817) 939-4571. 33% off at www.dfw.net/~morris/nscf.html (see NSCF website for further details). Breeze Ski/Max Snowboard Rentals, (800) 525-0314 x122. (60 locations in U.S./Canada - CA, CO, NM, OR, UT, WY, British Columbia, Alberta). 30% off rentals, 25% off shop services & 10% off retail sales at www.SkiRental.com. RentSkis.com (100 locations in U.S./Canada - CA, CO, ID, UT, WY, British Columbia, Alberta), (800) 544-6648. 25% off online equipment rentals at www.rentskis.com (some black out dates). Terry Sports (4 locations Steamboat Springs, CO & Taos, NM), (800) 233-7547. 25% off rentals, 25% off shop services & 20% off retail merchandise at www.TerrySports.com. Christy Sports (multiple locations in CO, UT), (877) 754-7627. 20% off rentals at www.ChristySports.com. $10 off per order for shipping sports equipment or luggage to/from resorts. Additional online discount at www.SportsExpress.com. The Sports Basement, San Francisco (2 locations), CA (800) 869-6670. 10% off any purchase at www.SportsBasement.com. crazeeHeads, Inc., Floral Park, NY, (866) 427-2933. 10% off decorative helmet covers (see NSCF website for further details) from Dave Cowen at www.crazeeheads.com. Gear Direct, 2650 South Havana, Aurora, CO, (866) 289-7547. Up to 7% off all online outdoor sporting gear purchases (see NSCF website for further details) at www.GearDirect.com. Snow Pro Deals, Lothan, MD, (877) 754-3325. Free sock liners with first order of snow sports accessories at www.SnowProDeals.com. Clarity Fog Eliminator Cloths, Nanofilm, Valley View, OH, (800) 883-6266 x131. Clarity Lens Cleaner Moist Cloths from Gina Montello at www.nanofilm.cc. East West Printing, Davis, WV (800) 262-5606. Custom t-shirts, sweatshirts, polo shirts from Janet Lennox at www.eastwestprinting.com. ResortQuest (15 locations - CO, ID, MT, OR, UT, British Columbia), (888) 683-9836. 15% off ski vacation rentals (see NSCF website for further details, blackout dates) at www.ResortQuest.com. East West Resorts (8 locations - CO & UT), (800) 763-5045. Up to 15% off minimum night requirements (see NSCF website for further details) at www.EastWestResorts.com. Discount travel also through East West Resorts VIP Travel Desk (877) 284-7545. Cellular Abroad, 3019 Pico Blvd, Santa Monica, CA, (800) 287-3020. $25 off international phone rental or purchase & $10 off SIM card purchase at www.cellularabroad.com. Mountain Chalet, City of Industry, CA, (800) 535-5438. 15% off orders over $50 (see NSCF website for further details) on snowsports posters, cards, t-shirts, cabin decor and other vintage gift items at www.mchalet.com. Penguin Group USA, New York, NY, (212) 366-2368. 15% off online book purchases (see NSCF website for further details) at http://us.penguingroup.com.